Earthworms are hermaphrodites, each having both female and male reproductive organs. Fertilized eggs are deposited in the soil in cocoons. Each cocoon produces an average of four eggs. Eggs hatch within three weeks. 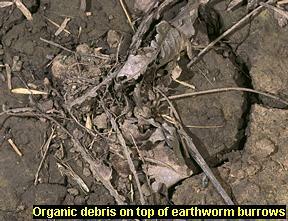 Earthworms burrow deep into the soil and come to the surface to feed on organic debris.